Hey Ministers: how will you respond? Today all the state and territory disability ministers are meeting to talk about the implementation of the NDIS and housing is on the agenda. They have in their hands the Every Australian Counts Housing Action Plan. How will they respond? Tired of waiting for governments to act on the critical issue of housing for people with disability, Every Australian Counts recently took matters into their own hands and asked supporters about their current housing challenges and what they need for the future. More than 650 people submitted their stories, their dreams and their aspirations for where and how they want to live. In looking at all the stories what becomes very clear is that the current housing arrangements for people with disability, their families and carers fall well short of their needs and hopes for the future. 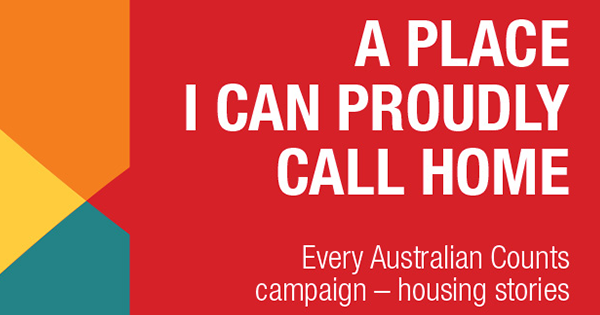 The themes collected from the stories and included in the Every Australian Counts Housing Action Plan, the plan of the community, send a strong message to governments to act to address the crisis in disability housing before the full roll out of the National Disability Insurance Scheme. You can download and share a copy of the plan here. It’s called a A Place I Can Proudly Call Home – a quote taken from Matthew who shared his story about living day to day in a budget hotel while he waits for community housing. All he wants is a place that is safe, affordable and close to the medical facilities he needs, “a place I can proudly call home,” he says. Every Australian Counts not only asked the Commonwealth and state and territory disability ministers to do a range of things to make housing more affordable and accessible for people with disability. We also asked them to do two things to show their commitment to us on this issue. The first one is to meet a delegation of Every Australian Counts supporters to hear first hand about the housing challenges in their jurisdiction. Often it’s not until Ministers meet real people that the penny drops on the significance of the issue and they start to want to help. The second thing we asked of the Ministers was to make a video statement to Every Australian Counts supporters outlining their government’s plan to tackle the disability housing crisis. We need to hear directly from them what they plan to do – they can’t hide on this critical issue. They are not big asks. Where and how people with disability live is critical to their health, wellbeing and independence. And to that of their families and carers. What exactly are “reasonable and necessary supports” if they don’t start with a roof over your head? Ministers, we look forward to your response.